How loud would you like your i8? Writing a Route 66 feature for Unique Cars a few years back, I admitted that the ‘proper’ car for the trip would have been a 1960 soft-top Corvette – the vehicle of choice of characters ‘Tod’ and ‘Buz’ in the ’60s TV series about their adventures on the historic ‘Mother Road’. The fact that we actually explored the iconic American route using a PT Cruiser was down to budget realities, plain and simple. At least the little Cruiser was a retro-car, and its styling paid subtle tributes to another iconic American institution – the street-rod movement. While the Cruiser proved to be utterly reliable and economical for the whole 5000km journey, the driving experience was undeniably bland. On one of the lonely stretches, daydreaming, I conceived a simple plan to give a Cruiser a bit of gravitas, a bit of street-cred. For minimal cost I figured you could hook up a dedicated audio-player to the car’s sound system and also feed an external speaker hidden under the rear bumper. At the flick of a switch this set-up would play a bass-boosted audio-file of the glorious sound of a big-block Mopar V8 speaking through unmuffled three-inch tailpipes. Hallelujah! – instant cojones for the PT as well as instant respect from passengers and the general public alike. 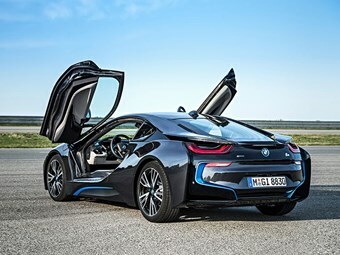 Fast forward to 2015 when an email from a mate living in Vietnam mentioned that he had spotted his first BMW i8; he went on to describe what an odd fit the exotic hybrid was, hemmed in by the hurly-burly mix of cars, motorcycles, vans and buses that makes up Saigon’s peak-hour traffic. Being only vaguely aware of the glamorous new Beemer I used this prompt as an opportunity to learn a bit more about the i8. Wow! Quite a goer, the i8. Not much in common with Toyota’s Prius. The i8’s 4.4-sec 0-100km/h figure and speed-restricted top-whack of 250km/h are right up there. Its healthy performance comes courtesy of a powertrain that produces a shedload of torque from the combined efforts of the 96kW electric motor up front and a 164kW three-cylinder petrol turbo-motor at the rear. Then an item in the fine print bowled me over. To compensate for its silent electric motor and quiet petrol engine the i8 uses electronics to give it some aural presence. The scale of its trickery goes way beyond my Mickey Mouse ideas for a Cruiser. Apparently a muted jet-fighter whine warns pedestrians of its approach while at the rear the petrol engine’s exhaust note has its potency boosted electronically. Inside the i8 you’re treated to a contrived sound that’s apparently a cross between an angry Porsche 911 and a howling V8. The level and intensity of the sounds vary with mode selection, engine rpm and throttle opening. Perhaps it’s just me, but I found the subject to be a real eye-opener as I soon discovered that engine noise enhancement has been used for some time across brands including VW, Lexus, Lotus, Mini, Porsche, Renault and Ford. Apparently the new 2.3-litre Ecoboost Mustangs use it. Try ‘BMW i8 enhanced engine noise’ in your search engine for more on the subject. The pretend engine-noise caper has certainly come a long way since my primary school days when we turned our push bikes into ‘motor bikes’ by clipping playing cards on to the forks with clothes pegs to extract a pleasing racket from the passing spokes.